TWIN NEEDLE: [Enters stage right, with a dramatic flourish.] Here I am! I will hem your knits beautifully, for just a few bucks and none of the table space you’d need for another machine!! I ROCK! SUSAN: Oh twin needle, thank you!! You’re everything I ever wanted! Not so much. In reality, my first (second, sixth…) attempt to use a twin needle resulted in a headache and a desire to hurl myself out of my first-floor sewing room window. I would have given up many moons ago, but I had developed a bit of a stubborn vendetta. (You’re shocked, I know.) I was acutely determined to figure this thing out. Flash forward about a year later, and I’ve discovered quite a few tidbits that can help. I love twin needle hemming now; it’s fast and easy, as sewing with knits should be! Important note: I have a Brother PC-420 PRW sewing machine, so some of these notes may or may not be applicable to your machine. Regardless, they could give you points to ponder in your own twin needle exploration. Since this is a popular machine, I wanted to point it out. The main issues I had with twin needle stitching boiled down to two things: skipped stitches & tunneling. There are a couple of other minor things that I address in the fixes below, but these were the worst of it. A few skipped stitches may not be the end of the world, but too many begin to look sloppy. 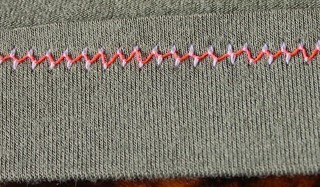 Even more importantly, a line of stitching is far more likely to snap where there’s a skipped stitch. Just like a 5.0mm stitch isn’t as strong as a 2.5mm, when you have skipped stitches, the hem is weaker. As an aside, some folks do this intentionally to work pintucks! However, it’s nice to be able to avoid them if that’s not the look you’re going for. So what to do? I did a lot of reading and researching and found a couple of helpful twin needle tips. (Make sure the threads are unwinding in opposite directions! Increase stretch with wooly nylon thread in the bobbin!) However, I wasn’t able to find anything that helped me get these two main issues in check. So I engaged in my own path of trial and error. Here are the results. Stretch vs. Not. When I sew knits with a non-stretch twin needle, I get skipped stitches. Period. Some knits (less stable ones) make this happen worse than others, but it always happens at least a little. Stretch twin needles can be slightly harder to find, but find them you can, and since I really only use them for hemming, one “pair” lasts a long time. Needle Position. This is one of those things applicable to the machine I use but may be for others as well. The Brother PC-420’s default needle position is left (instead of center), and to my knowledge there’s no way to change this programming. [Fortheloveofpeter, if you know how, please tell me.] I typically don’t have an issue with this, and I happily sew along in the left position until I find I need to move to the center for something. It took me a while to figure it out, but twin needle stitching is one of those somethings. Because the stitches aren’t centered between the feed dogs in the left needle position, I found the skipped stitches — and my control of the hem overall — to be much worse. Changing the needles to the center position helped a LOT. NOTE: I’ve sometimes read that loosening the tension will help the tunneling issue. That’s true, but it may also decrease the stretch. This won’t matter much in some cases, but in others — say, the hem of a slim-fitting maxi dress — it will matter a lot. I usually prefer to maintain the stretch of the hem and tend to the tunneling in another way. Fusible webbing. My friend Miss Lulu gave me this tip when I couldn’t seem to get the tunneling whipped. She likes the crisp edge this provides for knit hems, and I have to say that it has really grown on me too. I don’t use it every time, but when I do, it sure makes those hems act like they’re new graduates from Miss Manner’s School for Well-Behaved Knits. I like the results with Stitch Witchery Ultra-Light. I press up the raw edge about 3/4″, then slip in a piece of the webbing (which is 5/8″), then fuse. Proceed with hemming. The finished hem may not stretch quite as much as it would without the webbing, but it will still stretch, and I find the trade-off worth it. It may feel a little stiff when first applied, but after a spin in the washer/dryer, I can hardly tell it’s there. Stitching speed. Even if you normally like to see smoke coming off the spool, slow down a tad when using a twin needle. I’ve seen this reduce the skipped stitches somewhat, though many of the above tips helped me more. Stitch length. If nothing is eliminating your skipped stitches or tunneling, try changing the stitch length. Decreasing it or increasing it slightly can help, depending on your fabric. 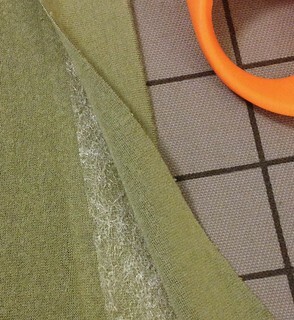 My only caveat is not to make the length too long, since doing so will weaken the hem. Lessen that pressure! This is not just applicable to twin needle stitching, but it is the single best tip I have for sewing knits. Also, it was a big selling point for me on my sewing machine — the ability to decrease the pressure of the presser foot. With lighter pressure, I never end up with wavy seams or hems, because the fabric isn’t being stretched as it goes under the presser foot. Huzzah! Do you have any tips that make twin needle hemming a raving success on your projects? Do tell! Update: I just finished my best knit hem ever, using these techniques plus some… Check out a new tip on my Cabarita post! Thank you, what a helpful post! I have never, in 50 years of sewing, used a twin needle. So I have lots of them still in the package, the ones that come with a new machine :-) Think it’s time I give it a go. 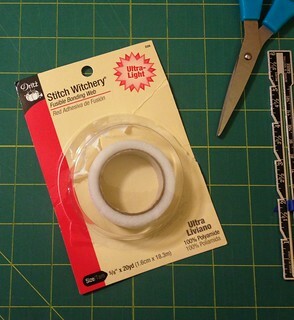 BTW, I use steam-a-seam in the same way you use the stitch witchery. Life saver…not just for knits, but for those tricky curved hems anywhere! I use steam-a-seam too, for other stuff! It’s funny — I have at least half a dozen types of fusible webbing in my possession, and they’re likely all practically the same thing, but I use them each for different things. I have no idea why — I probably just keep going with what works in each application. :) Good tip on using it for curvy hems, too! My one try with a twin needle soon after I got my machine was fairly dismal, but I may well try again armed with these handy tips. Thanks! Awesome! Pinned this for future reference! Thanks Gail! :) And thanks for the pin! Thanks for all the details, Susan. This is awesome. I truly love my double needles as well, but I seem to break at least one per project. Its getting pricey! I’m always having trouble with skipped stitches, I’ve found that REALLY slowing down helps, but I’m going to try some of these tips also. I was just finishing up a fleece jacket for a man friend (really need to get that blogged) and I MIGHT have had a few beers and a few girl friends over while I was trying to put in the hem with the double needle. I was cursing up a storm, I couldn’t get it to work at all! Somehow I got the hem in, but I took the needle out the next morning in the light of day and one of the needles was totally bent. No wonder the bobbin thread wasn’t catching properly. Lesson learned- never rule out the easiest solution to the problem (what, you thought the lesson was don’t drink and sew?)! I have yet to try twin needle stitching… something about it just scares me. Hehe… I will need to give it a try though and bookmark your page for easy quick reference for when I do. Thanks for the tips! Great tips and thank you for sharing… fusible hemming tape sure does come in handy and really makes a difference with knit fabrics for sure! They totally do make a big difference! Thanks Chris! I will be bookmarking these tips for later. Thanks so much for sharing! No problem — hope it helps! This post is perfect. I tried twin needle hemming when I first learned to sew knits and I had skipped stitches, tunneling, and no stretch. So I switched to zig zag. Thanks to you I’ll try again. Thanks! I’m glad to hear that you’ll try again, and I hope these things help you as much as they have me! Thanks so much for the advice. i have been having tunneling issues. I’m pinning to my sewing tips board! You’re welcome Justine, I hope it helps! Thanks a tonne for this – I bought some twin needles when I was in the US, and have been looking for tips and advice on using them. I’ve only used them for pintucks so far, but your post has inspired me to do more.. When using Twin Needles, use stretch needles for knits. Period. Also, if you use Wooly Nylon in the bobbin, it “gives” to avoid popped stitches. Remember, that bobbin is servicing TWO needles. Another tip, if there is tunneling, try Twin Needles that are closer together. I prefer 4.0 but sometimes I must resort to a 2.5 depending on the type of knit. Thanks Alison! I also prefer the wider needles but what you’re saying makes sense; I will try the more narrow ones in the future! I have three Brother machines and could not get one of them to sew correctly with the double needles. But I looked all over for info on the net and could not find any. Thank you for these tips. I sure needed them. PS. Between we, I do have a serger but sometimes the sewing machine is a much better option. And I have wanted to do twin top stitching but have not been able to to date. Thanks Again. I have the same machine so thanks for mentioning it. I never thought about the centering concept! Wow, I’ll have to experiment with that. Well, I don’t recommend this necessarily but on my last project I actually resorted to stretching on either side while twin needling to avoid tunneling. It worked! Left hand pulling on left side, right hand pulling right side! In retrospect, stitch witchery would have probably done the trick too. I tried twin needleing a couple of weeks ago when I made a bathing suit, but gave up because I had too many skipped stitches. It turned out just fine using zig-zag, but now I think I will retry on some scrap fabric, before I attempt the next one. That said, have you used twin needles on nylon/lycra? I haven’t tried that Donna, but would be interested in hearing how it goes for you! Such a good post. Thank you so much .. I am just learning to sew with knits [after sewing for 40 yrs,ha].. This is the most informative info, I have found. thank you so much. I am saving it. I’m really glad to find this post. 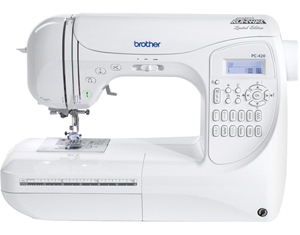 I also have a Brother PC-420 though I haven’t yet used the twin needles. I’m taking a Craftsy class in sewing with knits and will be using the twin needles for hemming knit fabric. But I noticed in the Brother PC-420 manual it says to only use the twin needle (part code X59296-051)–presumably this is the one that came with my machine. But I don’t believe it’s a stretch twin needle. I’m happy to see that you have had success with using other needles. (I’m reading that right, aren’t I? You did use other twin needles that are stretch twin needles.) Thanks for the post–much appreciated. Hi Kim, thanks for your note. It’s my understanding that the primary concern is to ensure that any twin needle you use is not too wide for the machine (i.e., no wider than you’re able to zig-zag stitch), as that could cause damage. I have shopped the BrotherMall website before for machine feet and such, and I just looked there for these replacement twin needles and they don’t have them, which seems odd if that is the only twin needle able to be used with the machine?? I’ve had the same twin needle struggles and have occasionally resorted to a zig-zag on light fabrics that wouldn’t cooperate! All of what you described is great (I must try that Stitch Witchery!) but I found that the walking foot also helps on my sewing machine, so the two layers of fabric aren’t trying to move at different rates. (Unfortunately the walking foot for my Viking Platinum 730 cost me almost $100, but it does help with knits a lot). Hi Susan, A couple quick questions I hope you can help me with. I’ve torn out about half of the hair on my head with this double needle process. I love the way it looks so I’m just stubborn enough to keep trying until I’m bald! It’s the skipped/loose stitches. Can’t find the original pkg. the needle I’m using came in, so not sure what kind of fabric I should be using it on. However, after much trial and error, I did find another double needle: Schmetz twin needle 130/705H ZWI 2,0/80. What it doesn’t say is for what kind of fabric. Knit or Woven nor does it say if it’s a ballpoint or ?. I’m going to try it after I send this email. The needle I have been using that skips and makes loose stitches works good for about an inch or 1/2 inch of sewing, then the loose & missed stitches start. Additionally, I’ve **tried each side of the twin needle individually….no skips, no loose stitches. I’ve also tried: **adding an additional spool pin so that I’m not stacking two spools of thread, **not running the thread from one of the spools through the last eyelet (which is closest to the eye of the needle). Hi Debbie! They can be so frustrating can’t they?? The needle you’re describing is a regular (I think “universal”) — it has the red plastic thingie on it like the left one in the pic above? If it’s a “stretch” needle, it will say so, and that’s the one I’ve had far better results with for knits. Having said that, it does depend a little bit on the fabric itself. If you’re hemming a stable ponte, the universal twin will probably work fine, but for a slinky rayon knit forget it. Especially if you’re using a universal, I’d *really* recommend using the fusible webbing. I’m not sure where you are or what stores you have access to, but here’s an Amazon link to the ones I use. You can also get ones with the needles closer together, but this one is my favorite: http://amzn.to/155YPlt I am able to get these at a local independent fabric store, but I’ve never seen the stretch ones at Jo-Ann. I hope this helps! I’ll be interested to hear if you were able to resolve it. Dang, you’re good! Thanks ever so much for the speedy response. This morning I went to Walmart and bought the fusible webbing. I have never used it before, but everyone online talks about it. Just getting back into sewing after a 40 year semi-hiatus. As for your recommended website at Amazon, :) I’m one step ahead of you! Checked it out this morning and learned it’s near my brother (sewingmachinesplus.com) in San Marcos. He says it’s close by Eleanor Burnes (Quilt in a Day) digs. I have visited her quilt shop and have actually met her! Was exciting for me, everyone else says “Eleanor who”. Anyway, I’m sending my brother and sister-in-law shopping, and preparing to apply the fusible webbing. Thanks again for taking time to reply, and so quickly! I’m looking forward to your blogs. Oh good! I think you’ll love the fusible webbing as a aid to knit hemming. It makes such a difference. Don’t worry if it feels a tiny bit stiff at first, that will go away with the first washing. Did you get a “light” one? Those are best — I’ve had great results from both Stitch Witchery Ultra-Light or Steam-a-Seam 2 Lite. And hey, your brother is close to me! (I’m in Georgetown.) :) I’m glad you found a source for the stretch ones; you won’t regret it! ….or is it “your blog”? Thank you so much for your post on this subject. I have tried using my twin needle multiple times, but always get the tunneling effect. I will try your tips. Avoid using pins or pull them out before stitching as each of the twin needles tend to slip over pins at different rates and can also end up breaking or buckling the needle = destroyingthe precious twin needle. Thanks for all the tips! thank you so much for this column, i use twin needles for pintucks but never was able to make a hem on a t shirt without stretching everything out of whack so i do them by hand, dont laugh. Now will give this a try! thank you for sharing!! No one seems to have an answer to my twin needle problem. Top stitching is beautiful, no tunneling or skipped stitches. However, the bobbin thread simply pulls out no matter what tension/settings/fabric I use (and I’ve tried a million combinations). HELP! This is only a problem with twin needles. Virginia, I’m having the exact same problem as you. Ever get it taken care of? I noticed that Susan mentioned to increase the upper thread tension to take care of this problem. Tried this but nothing is working~ I have a Janome Horizon 7700QCP. It is about to drive me nuts! 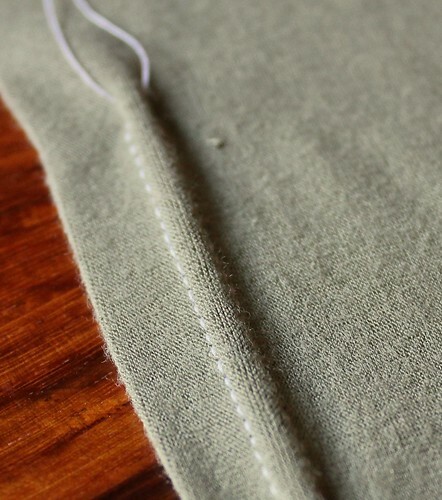 Fantastic blog on hemming knits. I had to google “twin needle hem for knits” and there you were! I’ve tried all the techniques from the sewing gurus, some of which are awful! Hem with a tiny zig zag? Yuck. Your steps were beautifully photographed and worked for me. A bit of tunneling still, but I’ll try the narrow twin needles next time. I always use my walking foot when sewing knits, I assume you do too. Thanks for doing all that testing for us. I’m so glad it helped, Amanda! One other tip about that starting point… Behind the presser foot, hold on to the threads (both upper and bobbin), and use them to pull the fabric gently until you’re a few stitches in. That really helps me with both sheer fabrics and knits! Hi Susan, your work really helps! Your tips solve my problems with the twin needle. I sew only for some mounths, but thanks to some bloggers like you I have great progress. In the beginning -using double needle- I had all those problem you refer to, now that I have a walking foot everything is MUCH easier!!! the only thing that I might have to adjust is the tension of the threads(depenting to the type of the fabric). I love your writing style! Thank you for the post! I gave up on the twin needle. Skipped stitches, stretch or ball point. I got so frustrated I bought a cover stitch machine. Problem solved. Still a lot of questions about needles, etc. So nice to have people who share their experiences. Thank you…. I may still have a go at the twin needle. Arggghhhh those problem are stressed me out. All the solving way above i already try unless the specific needle and fusible web. Thankyou very much for the tips. Now im afraid where is to get them both. Lol..
Have you used Wondertape? I think it’s amazing and it washes away. Best of both worlds. You can get it on Amazon. It would keep the knit stiff and in place whilst sewing, also great for putting zips without pins. Only problem you may encounter is a sticky needle but this rarely happens. Will have to try this as never thought about using twin needle for anything other than pintucks. I have been trying to sew with the twin needles. My issue is that the right thread keeps fraying and then breaking. Any thoughts on that? I have followed all directions I have found online for threading, tension, etc yet it keeps doing this. Another thing that happens is that the thread under neath bunches up and causes a jam. Any thoughts on that too? I have the same problem. Do you have a solution? 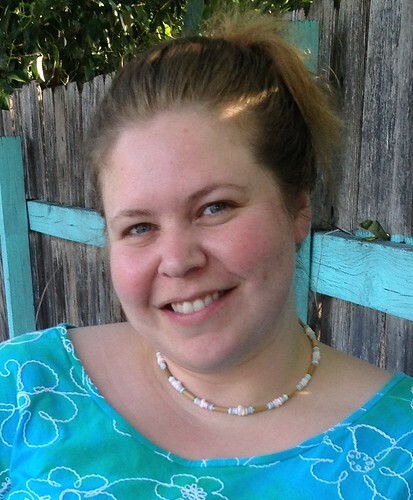 Love to Learn – Sewing with knits – Get Set, Sew! Glad it helped, Janet! And that’s a great tip, too! Hi there, I haven’t seen an answer to my problem anywhere, maybe you can help? I sewed several test runs that went pretty well on a piece of jersey fabric. Then when I went to do the real thing on a skirt made out of the same fabric, I couldn’t get it to work at all! I finally realized that the difference was the direction of the fabric. Sewing with the grain was beautiful. Sewing against it never worked. One side of the needle just didn’t sew, but the other side made a nice straight line of stitches. I’m using a twin ball point needle. Any suggestions? There’s a couple of things I can think of offhand to try — the first is rethreading. The thread for the second needle might not be captured correctly in your tension disks. If that doesn’t help, it’s also possible that you have a bum needle. Although it’s rare, I’ve had brand new needles not work correctly straight out of the package because of defects. If you have another one to try, give it a shot! Thanks Susan! Unfortunately the rethreading didn’t work, and I’m not sure it’s a bum needle…it did work fine when the fabric was a certain direction. I repeatedly tried it both ways to make sure. Isn’t that odd? Surely it’s not a weird fabric? It’s modern jersey from Spoonflower.com. thank you so much for this – I like many others was tearing my hair out trying to get my Janome to twin needle stitch on a lightweight knit. Thanks to you I am now a) using my walking foot b) going slower c) shortening the stitch length from 3 to 2.6, d) have the tension on 4, and for the most part this is working. I’m still having trouble with skipped stitches when I need to go over a thicker bit (like a neck binding seam, and there is no zigzag on the back, but things are an awful lot better than they were! Thanks again. Update – if I increase the foot pressure to maximum as I go over the ‘hump’, that seems to have sorted it! So, I’ve read through this whole page, and the comments, as well as numerous other blogs. I am still having trouble with my double needle stitching. I have a very old machine but it is totally capable of sewing with a double needle. I have changed the top and bottom tension, I have lengthened and shortened the stitch length. i have re-threaded and re-threaded. I am using a stretch double needle. But with all that – I still get the look of your picture where your orange bobbin thread runs straight. I can pull it right out, no problem. It doesn’t zig zag. My usual top tension is around 5 and I’ve tried it all the way up to 7.5 and it still doesn’t zig zag underneath. I’ve tried with a wooly nylon stretch thread in the bobbin. I have tried with a stretchy stay fabric underneath…. Any suggestions? Hi, thanks for all of your tips, I’m sure they would be very helpful. I’ve been sewing for years but now I’m sewing for sales. Currently I’m working on a dressy casual girls dress, made with that ruffled knit fabric. That fabric alone is impossible to work with, the ruffles make everything so difficult. Anyhow, I decided I would use my double needle and expedite the process. I broke the (my) left needle on both pairs. Would you have any ideas as to why that would happen? HI!! I just finally tackled the twin needle. Well at least putting in in/on my machine. I have a Brother Machine too, though, less fancy. I can’t, haven’t figured out yet, how to adjust the feed dogs. I appreciate your very helpful advice about tunneling and I noticed I wasn’t getting a zig zag on the back either. So many thanks! The problem now is my left needle breaking when I stitch over a previous seam. I just broke two right in a row! Frustrating!!! Especially when I was just sewing along nicely….til the seam. LOL!! Do you have any suggestions?? I just skipped over it for now. I’m on my last needle(s)! Any and all ADVICE is deeply welcome and appreciated. Thanks so much for such an informative post! I just sewed up a jersey tee with a double needle and when I put it on and wore it a while some stitches popped. I’m like you — slightly obsessed with making these work — and I think the issue was not enough thread tension. I’m going to try that now. Thanks again! I’m just seeing this post. So HAPPY for the information and all the comments. I spent hours thinking my tension was the problem. It was the direction of the spool. Thanks, Susan! I’m about to fuse my hem with Heat n Bond Softstretch. Should I sew through the adhesive or just along side of it? Thanks! I am too pulling my hair out with this double needle business. I’m so glad I too am not the ONLY person who is obsessed with Getting this RIGHT. My bobbin thread just lays there in a straight line not attached by any tention WHAT-SO-EVER!!!!! If I pull slightly on it it slides out like nothing is holding it there AT ALL. I used streach thread and regular thread. I am at my wits end. I looked and looked and searched and finally came across this blog…… THEN I re-read my manual for the 100th time when I noticed it said to ONLY use a 2.0 / .75 double needle. So I’ve ordered one online and I’m waiting for it to get to me. Thanks to everyone who has commented and for the WONDERFUL blog information.My machine is a simple Brother with only 27 stiches LX2763. I did have a fancy computerized one until it accidentally fell on the floor and stopped working. This is just a note to say I used EVERY last suggestion on this Blog and it WORKED💙💥💙 I did it all. There are 10 different things I have listed on the front of my manual and after checking off every last one my double needles are sewing just like they graduated from that Ms. Manners sewing class with honors!!!! 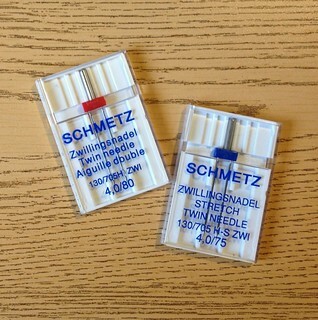 Sewingmachinesplus.com carries the hard to find twin needle #2.0/75. That was the biggest problem I was having. My manual said to “only” use that size twin needle with my model Brother LX2763. I followed all of “your”suggestions and finally my twin needles are working. Stay tape or fuseable webbing can be substituted with long skinny strips of cotton sheet material. Goodwill has lots of 100% cotton white sheets and that’s what I have been using. So, i have a brother nq700 and in the manual, they say to use only a 2.0/11 twin needle X59296-121. I wanna use a 4mm twin needle…what wrong can really happen if i do so…. Hi there! I’ve been enjoying all of the helpful information & comments. My problem with twin needles is skipped stitches on the right needle only (left is fine).